Dibutyl phthalate is a plasticizer and solvent that is also an endocrine disruptor. Chronic exposure through ingestion can cause liver and kidney failure in children. Toluene is, a mild skin irritant considered a developmental toxicity hazard. This chemical is dangerous to nursing or expectant mothers, as it can be absorbed into the bloodstream and find its way into breastmilk. When inhaled, the chemical can cause drowsiness, headaches, and irritation of the respiratory tract (5). Nail polish is an accessory few people think about twice before applying. Many mothers even find joy in painting their child’s nails. 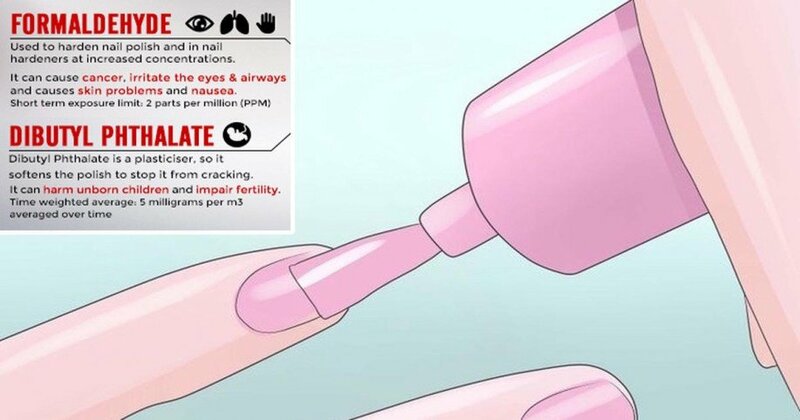 Nails Magazine reported in 2014 that market surveys found that 97 % of American girls ages 12-14 used nail products, including polish, and 14 percent of all teens and tweens used them daily (6). According to EWG’s Skin Deep cosmetics database, more than 1,500 nail products including polishes made by Sally Hansen, OPI and Wet N Wild, contain TPHP (7). The EWG study found that each layer of nail polish increased chemical exposure, with clear polish (used as a base and top coat for the polish) containing the highest level of DPHP. “It is alarming to think my ruby red nail polish could come with a side of toxic ingredients that could ultimately end up in my body,” said Entrepreneur and eco expert Erin Schrode, co-founder of the non-profit organization Turning Green, which educates teenagers about healthy and safe lifestyle choices.